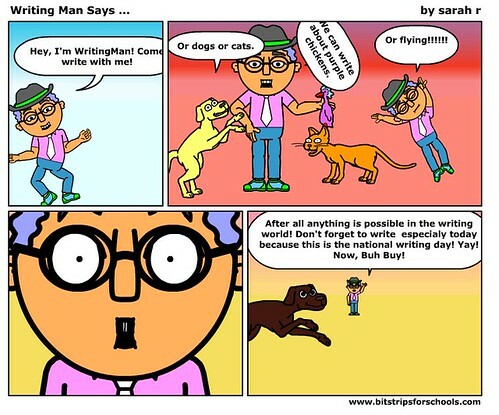 This is a comic for the National Day on Writing, as we think about communities that we are part of as writers and teachers. 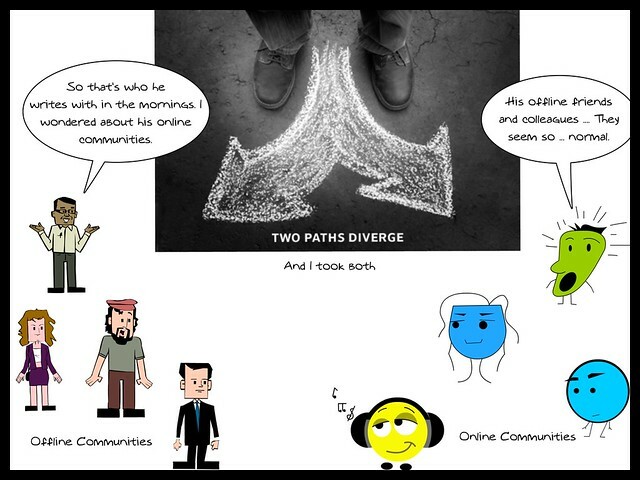 I was thinking of my online communities and my offline communities, and how there is not an either/or when it comes to connections — it can be both. This year, to honor the National Day on Writing, we created a massive block-letter WRITE on the back chalkboard in the classroom. 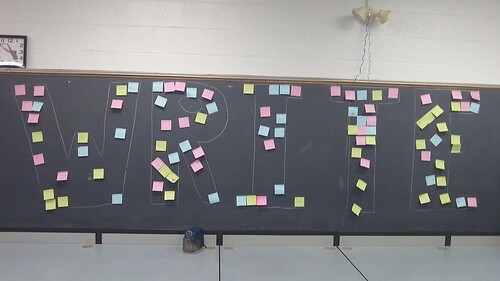 During the week, students used colored sticky notes to share the kinds of writing they enjoy doing. It’s been pretty magical to see the WRITE fill up with ideas. I’ve also had my camera ready, taking images as the sticky notes were being placed. Today, I am pulling together the various threads of a poem I was writing and sharing this week as part of the National Day on Writing. 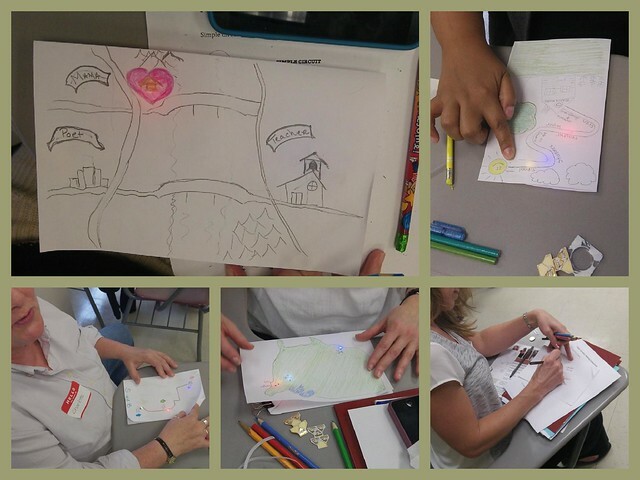 This Glogster project includes the text of the poem, the podcast, and the “inside look” at the writing of the poem video. 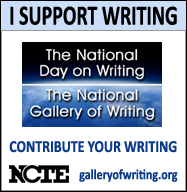 I’ve agreed to be on a task force with the National Council of Teachers of English (NCTE) to brainstorm and coordinate more outreach efforts for the third annual National Day on Writing that takes place this coming fall. This week, we will have our first phone conference and our coordinator sent along some interesting data to help guide our thoughts. This data (most of which comes from the 2009 Day on Writing, as the most recent 2010 data is still being sifted) comes from the National Day on Writing Online Gallery. There are plenty of empty galleries that folks set up but never used. It drove me crazy that I could not “embed” media (such as a digital story, or an audio file) right into my submission page. Everything had to be linked to another place outside of the Gallery. I think it is fair to say that most people will not follow those links, but they would watch or listen if they could do it right there on the Gallery page itself. Does the Gallery infrastructure allow for this? The look and feel of the Gallery site is, as one friend put it, like a throwback site from the 90s. I don’t know anything about the resources that are available to NCTE but it seems like the site itself could use a little more oomph. I’m not all that crazy about the homepage design. It is a large library and while I love and adore libraries, it is not quite the message of 21st Century that we want to send. At least, the image should have some technology component along with the stacks of books. Most libraries have made that transition. Given the day of interactions between readers and writers, isn’t there a way to allow for comments on writing? (this may not be within the mission of the effort, though, and the question of moderation would surely come into play). There must be a better way to search through the Gallery — can we create a “Stumble Upon” style of navigation for the site, I wonder. Or a “Surprise Me” feature? I’d like that. I wonder if people even come back to the Gallery to read during the rest of the year? I’ll ask about that kind of data. My guess is that folks submit writing, publish to the site but don’t do all that much reading. The danger is an empty space of writing, right? It would be nice to have a writing showcase are at the Gallery — right on the homepage — for a variety of different kinds of work. That might invite more folks in to look around. How can we best use the tools of social media (Twitter, Facebook, etc.) to encourage, invite and promote the National Day on Writing? This is an area that I will be thinking most deeply upon. How can we promote the idea of the Day on Writing to groups not directly affiliated with schools? I am thinking of YMCA, Boys and Girls Clubs, Scouts, etc., who might find the initiative valuable but either don’t know about it or know how to access it. This might be a “branding issue,” too, if this effort seems to be only school-based. I’m really looking for ideas from any of you, dear readers, about how to improve the Day on Writing and the Gallery experiences. If you have thoughts, I would love to hear them. Just write me a comment here and I will be sure to add them into the conversations this week.